Level 7 [escape] is a breath of fresh air for the dungeon crawler genre. In the typical “dungeon crawler” you and your group are heroes with awesome powers and weapons made for destroying any enemy or obstacle in your way. You attack enemies, and they attack you. You also usually have stats that you track based on health, defense, attack strength (melee and range) and intellectual ability. In Level 7 [escape] you and your group are weak test subjects that are better off sneaking through danger rather than drawing attention by attacking enemies. You’ll come across security guards and aliens. Not only are they your enemies, but they are also enemies to each other (something worth taking advantage of)! The stats being tracked in this game involve how much of a threat you are to the facility, how much adrenaline (health) you have, and how calm or scared you are. You and your fellow test subjects awaken to find yourselves deep inside a facility called Subterra Bravo (think Area 51). Starting with nothing but the clothes on your back (and the taste of nasty viscous liquid in your mouth) your goal is to make it out alive. It’s called Level 7 because you must make your way through seven levels (like floors in a building) to escape. The game is scenario based, which means there is a separate booklet with seven scenarios. You can follow the story of the game by starting with scenario one and playing through to scenario seven or you can choose to play a specific scenario. We highly recommend playing them in order first. The scenarios make the game fun to play over and over because each offers a different setup with different objectives. A strategy that worked in the level six scenario may not work on level three. Each scenario also has three difficulty levels. If you’re having a hard time beating a scenario, you can try easy mode. If you want more challenge, there’s always hard mode. Once you’ve chosen your scenario gameplay involves exploring rooms in the facility while trying to reach your objectives which allow you to escape. Each room is a separate tile, so you’ll be creating the board as you explore, which makes for a unique experience each time you play! A turn starts with moving and performing challenges. Challenges are essentially skill checks where you must roll a certain number of successes to accomplish the challenge. Challenges use either your strength or intelligence and involve things like sneaking past an enemy, attacking them, hacking a terminal, etc. After this you draw an event card which typically triggers something to happen based on the room you’re in. Event cards also control what the enemies will do, letting you know when a security guard or clone will appear, and when they activate. After you resolve the event card the next player takes a turn, and this continues until the players escape (or don’t). Players who escape are the winners of that scenario, but you don’t have to all work together or make it out. Players can choose to leave others behind, even use them as bait (although that’s pretty cruel). You will start each scenario with three, four or five vitality. This determines the number of adrenaline cards you’ll start with, and the maximum number of those cards you’ll be able to keep in your hand at any given time. If you get injured you will have to discard a number of adrenaline cards based on how badly you were injured. Say a security guard attacks you and you take two damage, you’ll have to discard two adrenaline cards. If you ever have to discard an adrenaline card due to injury and can’t, you are “knocked out” and your overall vitality lowers by one. If you’re at three vitality and get knocked out, you’re dead. Waking up in an underground facility (similar to how Neo “woke up” in The Matrix movie) full of security guards and flesh eating alien clones can be a scary ordeal. In order to make it out alive you need to control your fear. Your character has a fear scale of 1-8. You start the game at three, and then adrenaline cards, skills and encounters can raise or lower that fear. If your fear is low, you’ll be good at challenges that require intellect (like hacking a control panel) but you won’t be good at attacking enemies. If your fear is maxed out, you’ll be able to move further and hit harder, but you’ll also be much more appealing to aliens. Aliens in this game feed on fear, literally. They love to eat humans, and the more scared the human is the tastier they are. They move towards humans that are the most scared. Notice we said humans. You and your fellow test subjects, along with the security guards, are all tasty humans. If you keep your fear lower than the security guards, you’re much less likely to become a tasty snack! Maintaining control in a facility that is running tests on humans and aliens can be a tricky task. When test subjects start running amuck the security guards must focus on the biggest threat at any given time. Making sure that the aliens are more of a threat than you is vital to make it out alive. In most scenarios you will start with zero or one threat. You gain threat by being aggressive. Knocking an alien out, kicking a locked door down, moving into an area with a gun in your hand… these all cause you to gain threat. Note: some things cause you to permanently have more threat, while others simply give you more threat for the moment. Unlike fear which you can easily raise or lower, threat is easy to gain but much harder to get rid of. Also, if you become too threatening the facility can go into lockdown. Lockdown causes your group to have a limited number of turns left in the game to escape, and going into lockdown before you’ve found your exit can mean failure. The components work very well to allow players to be immersed in the game. The artwork is spot on with the dark and scary sci-fi atmosphere, and the fully illustrated flat stand-up characters and enemies are quite nice compared to miniatures which many gamers don’t have the time or desire to paint. The custom dice are also a nice touch. The scenarios are ordered in a way that allow you to gradually learn the rules of the game. They also have great introductory stories that get you immersed in the game. Because the rulebook can be difficult to refer back to when you’re looking for clarification, we recommend downloading the rulebook as a PDF so you can simply use your PDF reader (laptop, tablet, smartphone, etc.) to search for the term/rule in question. This is one of those games that can be a bit tricky to learn, but is easy to teach. Only one player needs to know the full set of rules, while the others can easily play by knowing the basics of what their character can do. After you play the first couple scenarios you’ll have the basics down, but each scenario changes things up, so there’s a bit of a learning curve for each scenario. We did need to go to the Privateer Press forums to clarify some things in the rule and scenario books, but they’ve since published an errata so you’ll want to give that a look if you own the game. The rules are a bit complex and the theme a bit intense for a game you’d sit around the table with your kids to play. If you’ve got teenagers that like board games, this might be worth looking into because it’s a cooperative game. This isn’t a game you’d pull out at a party to get to know others better and have a few laughs with. Though there is a lot of strategy involved in the game, there is also a lot of luck. The event cards, adrenaline cards, randomly generated game board and dice rolls all create a lot of unknowns with random outcomes. The rules are pretty involved, but if someone in the group already knows the rules this could be a game casual gamers could really enjoy, especially since it’s a “semi-cooperative” game. This is a great addition to an avid gamer’s colleciton. If you’re an avid gamer that also loves cooperative dungeon crawlers this is a absolute must have! The depth of strategy along with scenario based gameplay will appeal to power gamers. Each scenario offers the chance to adapt your strategies, and the additional story line that follows the game adds a much higher level of immersion. The game being scenario based might cause some to ask “does the game have much replay value and will I play the game again after I’ve beaten all the scenarios?” The short answer is yes! The long answer is… If you only played each scenario once, you’d have seven gaming sessions. You probably won’t successfully escape all the levels the first time, so if you’re like us you’ll want to try again until you make it out alive! So now you’ve got a game that you’ll bring out at least 10 times. Each scenario will have you setting up the game in a unique way, with different objectives and rules. You’ll get to explore different strategies for each scenario. On top of that each scenario has an easy, normal and hard mode. If you’re looking for the ultimate challenge, try to get the same four characters through all seven scenarios alive… in hard mode! Another shining aspect of the game that I can’t speak highly enough about is how you are not the only enemy on the board, and you have the ability to use this to your advantage. It’s very gratifying when you sneak past a guard and an alien and then watch them fight each other. A part of the game that can be a struggle is the fact that you ARE able to attack enemies, but you probably shouldn’t. You’ll even find pistols and other objects that you can use as weapons. But attacking enemies and busting down doors is a slippery slope that will only draw unwanted attention. The reason this can be a struggle is because most board games and video games have you blowing enemies away, not trying to sneak peacefully past them. That all said, it actually adds to what makes this game so fresh, tense and fun. We’ve enjoyed many other dungeon crawler games where our group barely survives as we battle hordes of monsters in dark dungeons. But before this game we had never experienced what it was like to be part of a group of nearly defenseless test subjects, balancing our level of fear as we tried to escape a facility we were never meant to escape! Level 7 [Escape] is a sci-fi horror game, which I thoroughly enjoy. The survival horror genre has been inundated by zombie games, so this is a breath of fresh air. The mechanics of the game keep players in a constant state of choosing between two bad options. Players must survive against the tiles, the enemies on the board, and sometimes even the other survivors. A survivor’s score sheet show the player’s skills, threat level, fear, and vitality. 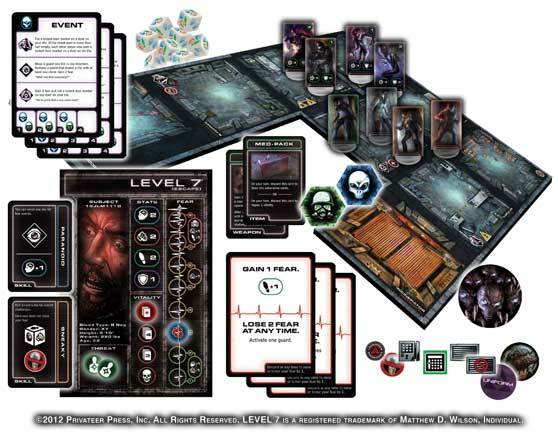 Skills are drawn at random from a deck of skill cards and grant bonuses such as a +1 to intelligence or the ability to move fear up or down one space per round. A player’s Threat level is how dangerous guards perceive the character. Guards will pursue a higher threat first. In the same way, the aliens (called clones) will pursue the player with the highest fear level. Fear levels can also grant bonuses and restrictions. Finally Vitality determines the maximum number of cards in a player’s hand. When a player’s hand is empty, the survivor is knocked out and loses a vitality. Too much punishment and the survivor will die. The part about Level 7 [Escape] that appeals most to me is the exploration aspect, which makes the game different each play. The map is explored by laying tiles from various stacks, which reminds me a lot of Zombie in my Pocket and Airborne In Your Pocket. I have also heard of it being compared to Carcassonne. After a few plays, players really get into the survivalist mindset. They might risk losing a few adrenaline cards in order to knock out a guard to let a clone eat him (which initiates fighting between clones and guards). They might also place locks on doors leaving other survivors to fend for themselves. I gave the game a replay value of 4/5 because it appears to be heavily scenario-driven. Once the scenarios have been played out, players would have to get creative to make their own. However, the scenarios themselves are well worth the replay as the maps and survivors’ skills are different each game. I was pleased with the components and gave it a 4/5, though it is quite a large box considering how compact the components end up being. Also, I heard some complaining in forums about Privateer Press being known for miniatures and yet this is almost entirely cardboard punch-outs. I appreciate the artwork, though the set is not the best I have ever seen. I gave a 3/5 on easiness to learn. I am not a terribly advanced gamer, but it took my friend and me a few plays and a second reading of the rules before we fully grasped them. However, for someone who has never played a board game before, it could prove problematic. I loved the game and I enjoy playing it. I like that there is a one-player option and I recommend this game to any board gaming horror fan. OK, let’s face it. It’s difficult for a board game to actually generate the sensation of fear. With all the exposure to movies and video games these days that have explored all the niches of terror, there’s little a board game can actually scare you with, especially since you tend to see all the pieces and components beforehand when you’re in the setup of a game. But there is one thing that board games can be really good at setting up, and that is a feeling of tension, closely related to fear. And Level 7 sets that up nicely. The game is all about fear, actually. Only, it comes in the form of managing fear. Every player in the game has a character that starts at a certain fear value, and through the use of cards and events that happen throughout the game, the fear value can be raised or lowered depending on the situation. Being fearful can be useful in a flight-or-flight situation, while being calm and composed can help with figuring out a lock or by being sneaky. To that end, characters are supplied with adrenaline cards which represent vitality; if an injury requires you to discard adrenaline cards you don’t have have, you either get knocked out or die, depending on how injured you have been up to that point. But I am getting ahead of myself. Basically, the game revolves around a huge conspiracy made with humans and aliens together to procude other humans as ‘test subjects’ for a hidden underground lab. Something goes wrong (or right) and the system malfunctions, allowing one (or more) test subjects to regain consciousness and attempt escape. Of course, since you’re in an underground lab, no one knows about you and no one is coming to help you; it’s up to you to find the way out and free yourself before your jailers come back to capture you…or worse. The game is called Level 7 for a reason; you as a test subject have been kept on the lowest level of the prison. To get out, you have to find the elevator to make it up to the next level, and you have to do so before the prison goes into lockdown; failure to do so means all exits are sealed, leaving whoever has not yet escaped to be doomed to remain underground. Finding the elevator is hard enough; sometimes the power goes out or a guard has a special key, which further complicates issues. But no one ever said escaping an underground complex would be easy. Every character starts with a couple of skills which define what the character can do. They are picked at random, and can include anything from being able to bull rush more effectively to being able to reroll attempts at certain skill tests. Most skills come with an inherent bonus to any of the four stats, making some characters better at some things than others. In addition, there are items that characters can pick up and use; some of them are weapons that can help in a fight, while others are necessary to complete a story objective or to open up other areas for use. As players explore the prison, they effectively ‘build’ the prison, using tiles that are arranged beforehand randomly in several piles. This ensures that someone can’t just find the elevator right off the bat, as well as providing opportunities to explore and find some help in the form of items. However, some rooms will trigger events, that can result in the spawning of guards and/or aliens to prowl around the prison, as well as the raising of a character’s fear and/or threat level. Let me explain threat; it’s effectively a measure of how deadly the guards perceive you. You gain threat by events, using a gun, etc. (pretty much aggressive acts) A higher threat means the guards will be coming for you, while ignoring anyone else. If your threat value becomes too high, the guards no longer think they can handle the situation and will put the prison into lockdown, which is something you want to avoid at all costs. Threat works in contrast to Fear, in that the Aliens LOVE fear and will go after the player with the highest fear value. However, the aliens and guards are also foes of each other, and don’t always work together; they can easily attack each other rather than the players, if the fear and threat values cooperate. Making skills tests pretty much works the same way for combat and other tasks; players roll dice and try to beat an assigned number of symbols needed. The dice for Level 7 are very unique; each side bears a number of symbols related to a character’s stats. Three sides contain all three symbols, while the other three contain doubles of one specific symbol (fist for strength, brain for mind, and shoe for speed). When performing a test, only one type of symbol will matter for success or failure; all other symbol types aren’t counted. A character’s stat value will indicate how many dice can be rolled for a particular test, making a high stat quite desirable, while at the same time not guaranteeing success. In combat, beating the opponent by the specified amount will knock them out until they can revive, while exceeding that amount by a significant amount will kill them. Alternately, a character can use the mind/intelligence stat to trick/sneak past a foe, which leaves them active, but allows a character to move past them as if nothing happened. What makes this game unique is that it is both a cooperative and competitive game all in one. You CAN work together with other test subjects to try and increase your odds of escape, but ultimately one or more characters will be hunted while the others are free to do as they please. In addition, once a player finds the elevator, lockdown immediately begins; if the rest of the players can’t make it to the elevator before a certain amount of time, well, tough luck. I like this game for what it provides; each game presents obstacles that make the going tough, and it forces players to make choices all the time. At the same time, it does require some practice to get the hang of, as sometimes the rules aren’t always clear right away. It may frustrate players who are not patient, but it is a rewarding experience once the flow of a game is established. Just remember: You don’t know the people with you. At any time they could stab you in the back. Do you really want to risk your life for them? There’s no assurances anyone will make it out alive; it might as well be you. Mix well. Add a handful of various chits, punch-outs and plastic feet. Bake in a patented Privateer Press Fun-Remover until ALL the pieces are well blackened. Because, you know, horror. Seal with plastic wrap. Overprice. Seriously, enough with the team effort “trying to get out of yet another randomly appearing insane crazy scary haunted weird place” game. Especially if the things that happen to your characters in game are completely out of your control. All you do is pop into some room that you don’t know what it will be until you draw it. Then you pull cards and roll (zombie) dice to see what happens. Start over when you realize you were not following the rules correctly. Two or three times. Read them again. Scratch your head and just make some judgement call to keep the other players from falling asleep. Rinse. Repeat. Ad infinitum. Here’s the catch. It is an exploration game. BUT if you actually…explore…and NOT follow each other literally one or two rooms behind the leader, you will lose the game. As soon as one guy finds the exit, Lockdown rules go into effect and unless you happen to be RIGHT BEHIND that guy, it’s game over (literally) for you. If you want to have any chance of all the players winning, this almost immediately turns into a game of “Follow the Leader (the guy who gets to go first) and hope he can roll 4 brains on 5 dice”. And not to drive the nail into the coffin, but…if you want to make a horror game that is supposed to bring out the atmosphere of scary monsters and such…it might help if the Event cards your players draw have some roleplay text on them. Betrayal at the House on the Hill does this quite well. With Level 7, the only flavor text you get is literally something like “They’re all out to get us.” Whoa. I nearly wet myself there guys. Great way to make a horror game. Not. In Level 7 Escape you’ll be fighting for your life as you attempt to escape from Subterra Bravo, a secret underground facility riddled with aliens (called “clones”), elite guards, and numerous other horrors. Memories of how you got there are hazy, and as one of many escaped test subjects it is up to you as to whether you work with your fellow escapees or use them as bait to save your own neck. Be warned though: Subterra Bravo is no walk in the park, and you’ll need to outwit not only your enemies, but facility itself in order to make it out alive. The very walls of this place seem fixated on keeping you there. This game is awesome to say the least, it plays fast and it’s full of tension. Tension, Aliens, Treachery. What’s not to like? This game is the most fun I’ve had with a tile builder in a long time, the emphasis on “semi cooperative” game play truly make it stand out as well. Level 7 Escape has an extremely evocative narrative and mechanics to match. It plays fast, set up time is relatively quick, and the enemy “AI” is deadly. I highly recommend reading the (short) rule book [Link here] cover to cover once before sitting down to play though, learning how enemies move and spawn is very precise but easy once you pick it up. 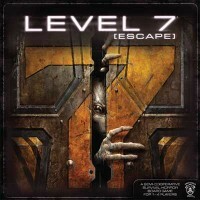 If you’d like, you can check out my Full Review & Unboxing of Level 7 Escape over on my blog. There is also a site called Level7Film.com that has a short intro film for the game, and a place to add yourself and your friends into the game, be sure to check it out! Add a Review for "Level 7 [escape]"